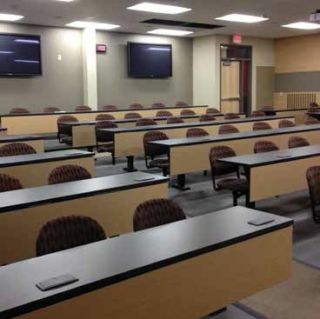 Denon Professional recently brought HD content to Eastern Washington University’s new residence and lecture halls. Education is facing an economic disruption. Just as the music and publishing industry models were turned upside-down by Napster and iTunes, just as retail has been disrupted by Amazon and e-Bay, education is having costs and methods challenged. One key ingredient to the major challenge of today’s educators is that they must begin to move beyond e-books. That is to go beyond creating content to building learning experiences. Remixable content is a creative approach suggested. Students want access to open source texts, object simulations, animations, immersive learning and games. They want social learning. They want learning on their schedule. The immediacy of the Internet translates into an expectation of new delivery modes, involvement, lower residency and briefer programs. Developers see changing the conventional grading into digital badges, that provide more detailed evidence of what was learned, instead of a mere grade that does not give an employer any degree of competence. According to Steven Mintz, director of Transformational Learning at the University of Texas, the challenges are clear. Rate of inflation plus 4% since 1979 is not sustainable as a cost model. By surveys, employers and the public do not believe college is of value—at least not the current terms. All disruption ripple effects start small. Georgia Tech is offering a $6700 graduate degree in computer science. The University of Texas has a $10,000 bachelor’s degree. MIT is unbundling all its courses. University of Phoenix is growing. And yet a Pearson publishing and Howard University had an aggressive on-line university plan crash, because of “Facing a lukewarm response from faculty members”. So, inherently even the advocates at the conference face a challenge to convince, cajole or do what it takes to have peers change habits. It appears the schedule is going to go away or become much more pliable. The 15-week semester is antiquated. Competency base learning must replace the clock. What physical changes will the campus take to accommodate this fluid movement? Mintz says the large lecture hall is becoming irrelevant. The core prerequisite courses that take place in them are not pertinent. Students are opting for getting these on-line or at smaller venues like community colleges. Emporiums, social studying areas and on-line are the answer, where Mintz says “students go from receptors of knowledge to creators”. Demographics show non-traditional learners offer great potential for institutions. Saving students is another issue. 30% of students who start higher ed do not get a degree. There is a huge, untapped market for learning and continued professional development. For this, Mintz believes certifications must become modular. Sub-associates, sub bachelors, and sub master degrees need to be created. These may be constructed into vertical markets or specialties that are industry oriented. The TA, teaching assistant, and instructor must become the coaches with additional extended services of e-tutoring, 24/7 help desks, learning support groups via social connections and other points of presence for the student to exercise their knowledge. Cross-institutional changes may occur where students take subjects from different places, or can be guests in classes or labs, to reinforce primary learning tracks. This will lead to needing a new business model; universities will re-engineer and spend money to face these challenges. There will be winners and losers. Those who embrace it will be effective only at the whole Program Design (not at the course level effort of a few bold advocates). Pedagogies, delivery methods, new specializations, and financial offers will adapt to market conditions. Where are the schools you work with? What conversations do you hear expressed? Bill Mullin, CTS-D, is the president of Starin.